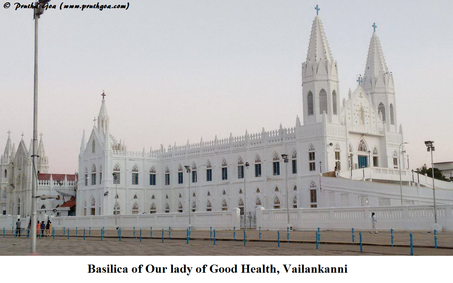 What is the allure of Our Lady of Vailankanni that makes Catholics and people of other religions throng to her shrine? Is it only the hope of having problems solved and intentions answered? To many it may seem just that and perhaps their understanding of religion and spirituality is so vague that it limits them to a narrow outlook of what a site of pilgrimage represents. 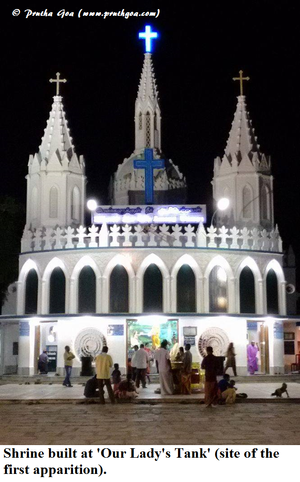 Vailankanni is a tiny town in the Nagapattinam district of Tamil Nadu and it has earned the title of ‘the Lourdes of the East’ for its intentional resemblance to the world renowned pilgrimage centre of France. The Basilica of Our Lady of Good Health is built in the Gothic style of architecture with a high dome and majestic Gothic spirals. Goans make up quite a considerable number of the pilgrims besides people from other Indian states. The construction of the basilica is based on the premise of three miracles which do not have the approval of the Holy See and were carried forth through oral tradition. Nonetheless the miracles that took place in the 16th and 17th century were seen as reason enough to consolidate the faith of the Catholic locals in the area and its vicinity. The first miracle involves an apparition in 1570 (?) of Our Lady with the child Jesus to a young shepherd boy who was delivering milk. He was stopped by a lady and was asked for some milk for the child she was holding. When the shepherd boy arrived at his delivery destination, his master was angry that the milk was given away. Before their eyes, the master and the shepherd boy saw the vessel fill up again. A shrine has been built here which is directly opposite to the basilica. A sand filled central path has devotees patiently walking on their knees towards Matha Kulam or Our Lady’s Tank as the place is named. Either side of the path is lined with life size images depicting the Stations of the Cross and the mysteries of the Rosary. It was a crippled boy who encountered the beautiful lady in 1597 (?) and gave his buttermilk to the little boy in her arms. The crippled boy was told by the lady to go to the next town and approach a Catholic man there to build a chapel in her honour. On his way to meet the man, the boy realised he had recovered his ability to walk. This place is called Nadu Thittu (central mound). A thatched chapel was constructed where the basilica is seen today to keep the lady’s wishes. Today Nadu Thittu has its own shrine with the portrayal of the second miracle. In the 17th century Portuguese sailors sailing from Macau to Sri Lanka were caught in a storm. 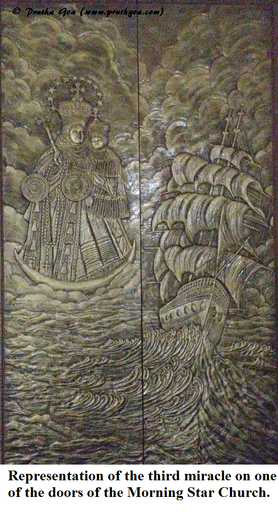 On invoking the help of Our Lady under the title of Star of the Sea, they witnessed the storm abating and were saved. 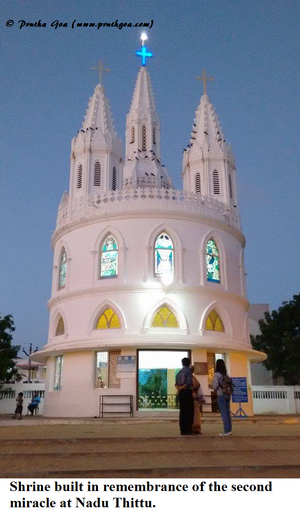 On reaching the shores of Vailankanni, they rebuilt the shrine to Our Lady of Health out of gratitude and continued with refurbishments whenever they visited the area. The pilgrimage site has the Morning Star Church, the Adoration and Reconciliation Chapel, a permanent exhibition on the history of salvation and the Museum of Offering among other important edifices built here. The Museum of Offering and the practice of tonsuring is reminiscent of cultural influences rooted in Hinduism. One has to ask the question whether this museum could not have been named the Museum of Miracles. The offerings seem almost a bargain with God…a God who is the creator of all things and has no need of physical gifts. The primary function of all miracles is to plant the seed of faith and nurture it. The best return you can make to God for graces and miracles obtained through the intercession of Mother Mary, is living a life that is pleasing to God. The wedding feast at Cana is a powerful reminder that we have to do whatever Jesus tells us to do in order to witness His power in our lives. 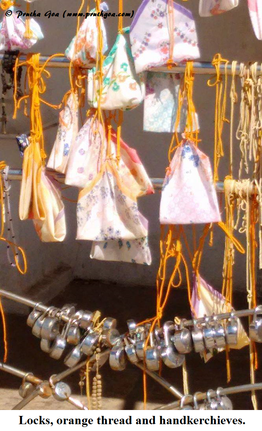 There are also locks, strands of orange thread and handkerchief cradles offered to symbolise the desire for security, togetherness in marriage/relationships and the gift of children, respectively. Perhaps the attachment to rituals, offerings and symbols is indicative of individuals being at different spiritual levels and the primitive need to reach out to God through visible matter. Nevertheless the power of prayer in a community is evident in the solace and serenity experienced in Vailankanni. The extraordinary as well as the subtle miracles that take place here prove the presence of God working in the lives of His children despite their weaknesses and failings.